President-elect Paul Gerber presents outgoing CSC president David Boyle, CTR, with a plaque in recognition of his term as president. Herb T. Guhl, FCSC, RSW. In addition, Laura Herbert and Brittany Mazzocchi, CSP, were recognized for their work in getting the CSC message out via Twitter. This award is presented to members in recognition of their contributions to the well-being of CSC. Board members can nominate or endorse the nomination of a member to whom they believe an award should be made beyond that of a Chapter Award of Merit for exceptional effort, zeal, effectiveness, and time expended for the benefit of CSC as a whole. 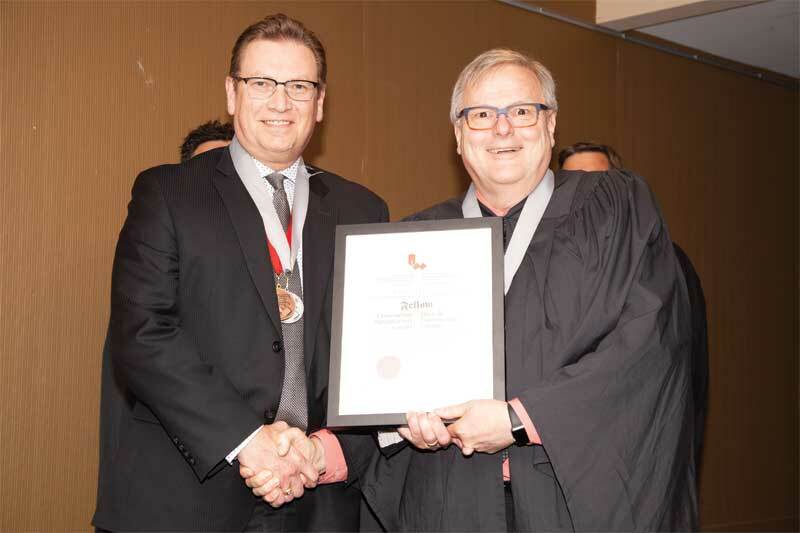 This year, Guy Houle of the Québec Chapter and Kazim Kanani, CSP, CCCA, of the Toronto Chapter were the recipients of the National Award of Merit. Houle was a driving force behind the revitalization and stunning member growth of the Québec Chapter, while Kanani worked to bring the PCD course into the college system. Kanani also took the lead in bolstering CSC’s social media efforts, website development, and more. Active on many committees, he has joined the Executive Council as 4th vice-president. College of Fellows chancellor Claude Giguére, FCSC, officially welcomes Peter Hiebert, CTR, into the College. This year, the ranks of the College of Fellows rose by one with the induction of Peter Hiebert, CTR. 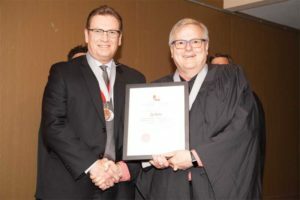 Chancellor Claude Giguère, FCSC, dean Peter Semchuk, FCSC, RSW, CCCA, CET, registrar John Lape, FCSC, FCSI, CCS, and treasurer Mike Garlinski, FCSC, were joined by many other Fellows at the induction ceremony. Hiebert has been a member of CSC since 1995 and recognized early on not only what the association could do for him, but also how he could give back. 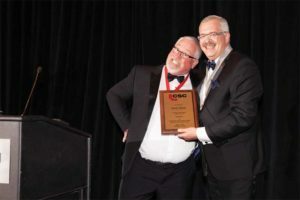 The number of awards he has received and the number of committees on which he has served are evidence of his contributions to CSC at the chapter and executive levels. Completing the CSC Administrative Manual updates and bylaw revisions were just a couple of the accomplishments Hiebert cites during his time on the Executive Council. Next year, the CSC national conference moves to Saskatchewan. Tim Walsh, CCCA, is chair of an energetic conference committee team, and plans for the 2019 conference—which will take place at the Delta Regina Hotel—are taking shape.